Facebook has announced that Instant Articles will be available to all publishers next month, on April 12, 2016. And to increase the number of publishers getting on board with Instant Articles, they have announced their own WordPress plugin to make articles Instant Articles friendly. Instant Articles is similar to AMP in that it creates an extremely mobile friendly version of a page or article that loads up to 10 times faster. 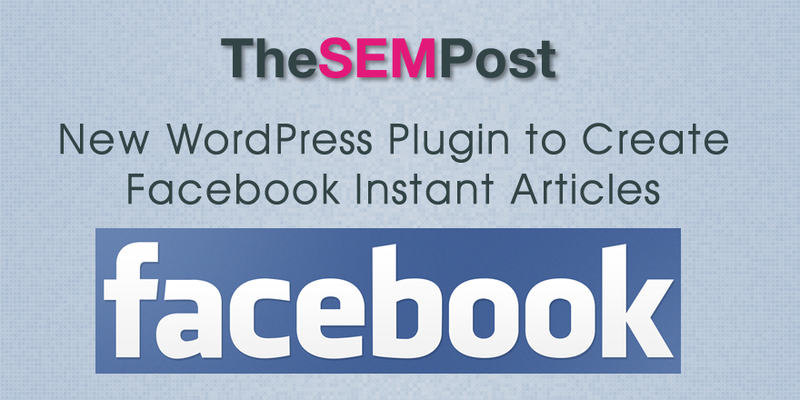 Like the AMP plugin, the Instant Articles plugin will make articles that load faster, right within Facebook, rather than the publisher site. This plugin makes it incredibly easy for publishers to come on board with Instant Articles, if they wish to use it. While there is full documentation, for those without a coding background, the plugin is an easy solution. Once you enable the plugin, you can start checking pages – one of the Instant Articles requirements is that it is fully validated. But unlike Google’s AMP which allows you to fix issues on the fly as they come up, Instant Articles requires the pages are validated prior to being used. Facebook has a review process where they verify that all Instant Articles generated from your website are properly formatted and adhere to their community standards and content policies before you’ll be able to start pushing content to the platform. (You can get more information in our Instant Articles FAQ.) Instant Articles generally should contain all the content a person would see in the web version of an article, so if you have extended the standard WordPress Post template in any way, it’s likely that you’ll need to extend the plugin’s default output too. The plugin is currently available on GitHub and it will be added to the WordPress plugin directory in the future. Will Instant Articles still allow our Adsense units to be displayed?